Immediately for rent is this neat furnished apartment on the 10th floor with balcony located on the Maas and with unobstructed views over the skyline of Rotterdam. Via the Maas Tunnel and Erasmus Bridge you can reach the city center in a few minutes. Within walking distance of the apartment are shops, supermarkets, cafes and restaurants such as the SS Rotterdam and Hotel New York. 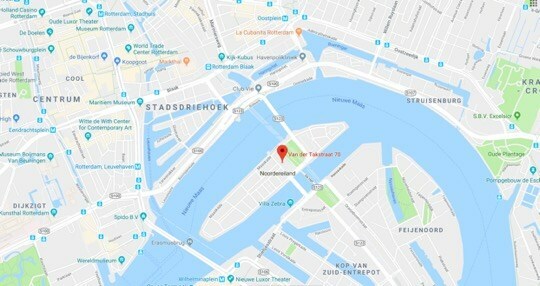 As an alternative to the regular taxi you can use the water taxi with a pick-up and drop-off point near the apartment! In addition, you are by car on the A15 towards Europoort, or the motorways towards The Hague and Dordrecht. The central hall with mailboxes and elevator is very spacious and very neat. The entrance also gives access to the container space where residents can dispose of their waste. In the hall inside: separate closed storage room with Combi CV boiler setup. A separate toilet and the renovated bathroom with spacious shower cabin, sink with shelf and washer-dryer. From the hall access to a guest room / study room which is equipped with a single bed. Spacious and bright living room with large windows, which provide the pleasant light and a fantastic view over the Maas and access to the spacious balcony. Semi-open kitchen in preparation with fridge, freezer, dishwasher and renewed XL oven with gas stove. Next to the living room is the pleasant bedroom with a lovely view of the Maas. This bedroom has a double bed and large closet.